Nemo me impune lacessit is the Latin motto of the Order of the Thistle and of three Scottish regiments of the British Army. 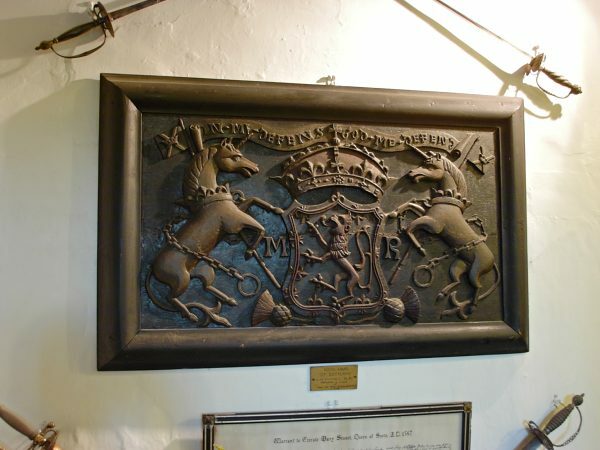 The motto also appears, in conjunction with the collar of the Order of the Thistle, in later versions of the Royal coat of arms of the Kingdom of Scotland and subsequently in the version of the Royal coat of arms of the United Kingdom used in Scotland. It is often translated as No one attacks me with impunity, or rendered in Scots as Wha daur meddle wi' me? ("Cha togar m' fhearg gun dìoladh" in Scottish Gaelic). It is also alternatively translated into English as No one can harm me unpunished. Armed forces units elsewhere have also adopted this historic motto. In Australia, the motto was also used by the Victoria Scottish Regiment, which subsequently became 5th Battalion Royal Victoria Regiment (RVR) which now forms one of the rifle companies of the RVR. (The motto is also used by the RVR Pipes and Drums Association). The Black Watch (Royal Highland Regiment) of Canada, a reserve infantry regiment of the Canadian Forces, also bears this motto. (The motto appearing upon the regimental cap badge). The motto is also that of the Cape Town Highlanders Regiment, a reserve mechanised infantry unit of South African Army. In Belgium, the 1st Squadron (Belgium) of the Belgian Air Force bear the motto, so too the 1st Battalion 24th Marines of the United States Marine Corps. The motto also appears (spelled "Nemo Me Impune Lacesset") above an American Timber Rattlesnake on a 1778 $20 bill from Georgia as an early example of the colonial use of the coiled rattlesnake symbol, which later became famous on the Gadsden flag. 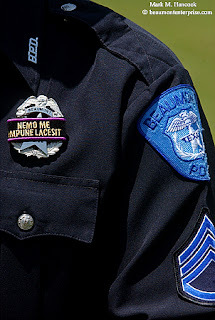 The phrase also appears on mourning bands worn over the badges of law enforcement officers in the USA. Also in America, at the Ivy League school of Dartmouth College, "Nemo me impune lacessit" is the motto of the College's independent conservative newspaper, The Dartmouth Review. It has been suggested that the phrase was originally used by Julius Caesar as he was attacked by the Roman Senate. However, according to legend, the "guardian thistle" (see Scotch thistle) played a vital part in the defence of the ancient realm of Scotland against a night attack by Norwegian Vikings, one of whom let out a yell of pain when he stepped on a prickly thistle, thus alerting the Scottish defenders. In the motto "No-one harasses me with impunity" (Latin: "Nemo me impune lacessit"), "me" was therefore originally the thistle itself, but by extension now refers to the Scottish regiments which have adopted it. Another traditional source appears in the form of a Scots proverb; "Ye maunna tramp on the Scotch thistle, laddie", this being immortalised in marble by Glasgow monumental sculptors James Gibson & Co. for the Kelvingrove International Exhibition of 1888. The phrase "Wha daur meddle wi' me?" also appears in a traditional border ballad entitled "Little Jock Elliot",  which recalls the exploits of a 16th century border reiver, ('John Elliot of the Park'), with particular reference to an infamous encounter in the summer of 1566 with James Hepburn, 4th Earl of Bothwell , the third husband of Mary, Queen of Scots. ^ Ian Gentles, "The Iconography of Revolution: England 1642–1649," in Soldiers, Writers and Statesmen of the English Revolution, edited by Ian Gentles, John Morrill & Blair Worden, pp. 91–113 (Cambridge: Cambridge University Press, 1998) p. 100. ^ Ian Gentles, "The Iconography of Revolution: England 1642–1649," p. 100, note 34.